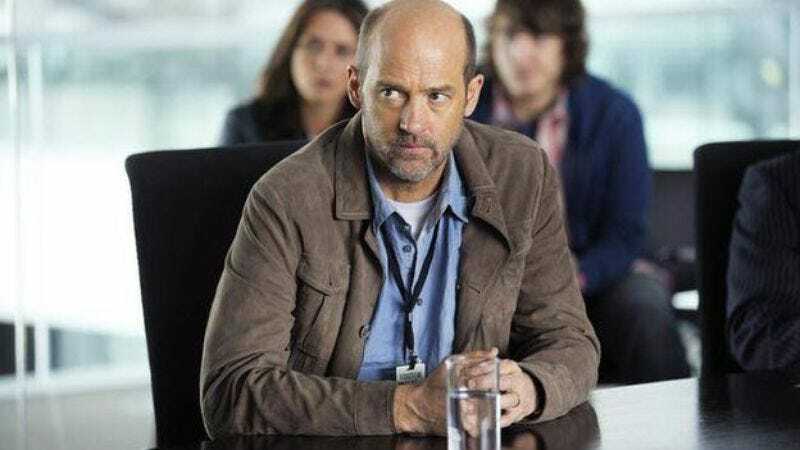 The actor: Anthony Edwards spent much of the ’80s jumping from one film genre to another, finding roles in a few decade-defining films in the process, including Fast Times At Ridgemont High and Top Gun, but by the mid-’90s, Edwards had settled into the long-running, critically acclaimed role of Dr. Mark Greene on NBC’s ER. Since leaving the series in 2002, Edwards has—excluding his turn in David Fincher’s Zodiac—kept a relatively low profile, but after a decade away from full-time work on the small screen, he can now be seen starring in ABC’s new action thriller, Zero Hour. Anthony Edwards: He’s an unbelievably curious guy, kind of an everyman, and someone who you want to root for, but definitely no one’s more surprised than he is about what he discovers along the way. The A.V. Club: Zero Hour feels pretty unabashedly like a cross between The Da Vinci Code and National Treasure, except that the hero is a family man. AE: Yeah, it’s definitely of that genre. [Laughs.] We’re of the world of mystery and adventure and the guy who’s a fish out of water. AVC: This is your first series since you left ER. Were you actively looking for another series gig, or was it pitched to you and just seemed like something that’d be fun? AE: No, I was looking. I actually thought I was going to do a series for Showtime. I developed it, it was something I loved and wanted to do, but for whatever reason, it didn’t go. So all of a sudden I found myself going, “Well, if I’m not doing that…” So I was kind of open to things, and they came to me with this, and I was so surprised. I think with anything good, the more you plan, the less benefit you end up having. Surprises in my life have always been the best experiences for me, and this is one of them. I read it, and I was like, “Really? If ABC’s crazy enough to make this as a pilot, I want to do it.” [Laughs.] And then the pilot went well, it tested well, and they said, “Yes.” And the series has been even more fun than the pilot was. So it’s been kind of a great surprise. But I think there’s a good mystery there, there’s gonna be details to follow, and they’re not sparing any expense when it comes to the visuals or the action parts of it. It really feels like a big show. They’re not skimping, that’s for sure. Which is great. AVC: How much of the character existed before you came aboard, and how much have you been able to bring to the character since you signed on? AE: Not really, thankfully. I’m a runner, so I love running, anyway. And being in New York City and shooting at home, it’s fun. And it always has a beginning, middle, and end. Yes, the rain machine’s going, and it’s freezing cold, and once in awhile you do find yourself wondering, “What am I doing?” [Laughs.] But it all has a beginning, middle, and end, and it always ends with you back in the makeup trailer, you’re warm again, and you’ve gotten through it. Besides, the challenge is half the fun! AE: Yeah, with Sean Penn! That was crazy exciting for me, because I was… I don’t know, 18 or 19. For me, what was crazy thrilling was that it was a scene with Hal Holbrook, and when I was a kid, studying acting when I was 12 or 13, the first acting class I had was a teacher putting on a videotape—we’re talking a reel-to-reel video tape, it was so long ago—and showing Mark Twain Tonight, which was Hal Holbrook doing Mark Twain. And it was like, “This is what acting is!” So I was hugely thrilled that my first scene ever on camera was with Hal Holbrook. But that was a movie that had Sean and Jennifer Jason Leigh… it was an amazing cast. AVC: You said you were studying acting when you were 12 or 13. What made you want to go into acting in the first place? AE: I’m the youngest of five kids, and I wanted attention. [Laughs.] And in Santa Barbara, there was lots of theater going on, so for that area it was a little bit like playing Little League baseball. There were dance classes, theater classes, and I just loved it. And like I said, I was insecure and wanted the attention. So I did tons of theater in school, and then when I was 16 and got my driver’s license, I started driving to Los Angeles, along with my friend Eric Stoltz, who was a year ahead of me and was doing the same thing. So we had the same manager, and we started auditioning for things and doing commercials when we were 16. We were just so micro-focused. AVC: Between your friendship with Eric Stoltz and your role in The Killing Of Randy Webster, it’s starting to come more into focus how you ended up in Fast Times At Ridgemont High. AE: Yeah, that was a big USC class. [Laughs.] Forest Whitaker was also in my class at USC, along with Eric. And then of course there were Sean and Jennifer again in that one, too. AVC: You don’t exactly have a big role, but the film itself has come to be seen as a classic. What do you remember about the experience of making it? AE: It was great, because it was written by Cameron Crowe, and at that time it was a pretty amazing thing that he’d gone undercover into a high school and written this really honest account of what a Southern California high school was like. So that made it interesting. And it was directed by Amy Heckerling, a young female director. I remember Sean was completely immersed in that character. Only a few times, only when it was just Eric and I in tow, would he not be in character, and only when we were nowhere near the set. Anytime when he was near the set at all, he was always in character as Spicoli, and he just stayed that way. He got a little apartment and just really immersed himself in the role. It was great to see that kind of commitment, that he as an actor did what he needed to do to accomplish something. And he didn’t do it to show off. He did it because that’s what his process was. And it was great to watch. AE: That was a buddy comedy with Forest Whitaker, but it was so overcomplicated in the shooting of it. It was such a simple, funny story, but it got so overshot that all the freshness of it got taken out of it, so I think as a result it ended up being not such a great movie. Because they almost put too much into it. I think they were like, “Oh, we have this funny script, now let’s do this,” and then they spent a lot of money on stunts, and a lot on this and a lot on that, and I just think the heaviness of it all dragged that movie down. AE: Ah! David Fincher is a longtime friend. As a director, my wife had worked with him as a makeup artist when he would do Madonna videos years before, and his child and my oldest child were in preschool together, so we’re kind of dad-friends through that, too. But then after all these years, I was in New York, and that summer he called me and said, “Hey, there’s a part, do you want to come look at it?” And it was unbelievable the amount of work that had gone into the creating of that movie. He sent us all binders of information about the report, filled with all the stuff that Armstrong had actually done, and it was amazing to see that detailed dedication of a filmmaker. Obviously David Fincher is one of the great American filmmakers, but, once again, to watch that kind of process is what’s fascinating to me. AVC: It’s all over the Internet that you supposedly had an uncredited role as a dental patient in the pilot of Police Squad! but using this interview as an excuse to re-watch that episode, it appears to be untrue. AE: A dental patient in Police Squad!? Oh, my God. [Laughs.] Well, I can tell you honestly that I don’t remember doing that, so someone’s going to have to actually show it to me to prove that it’s true, because I don’t believe it is. AVC: In that case, then, your first venture into the world of sitcoms must’ve been It Takes Two. AE: Yeah. Yeah, it was. [Laughs.] That, uh, got me out of college. I’d had two years at USC when I did Fast Times, and then came this sitcom with Richard Crenna and Patty Duke, along with a friendship that started with Helen Hunt that goes on to this day. Just a bit ago, I woke up to find Helen nominated for another Academy Award! But the sitcom world… what a bizarre thing, to rehearse for however long and then shoot on a sound stage, having an audience. It’s like Kabuki theater. It’s just a whole other style. It’s really wild. AVC: And that’s really the only sitcom you’ve ever done, right? AE: Right. Well, except for the one I got fired from. [Laughs.] I did a pilot for one, and I was fired and replaced by Chris Meloni! It was called The Boys, and it was… oh, God, who was it? The guy from Deliverance. Great character actor, squeals like a pig… Ned Beatty! It was written for Ned Beatty, I believe. But for whatever reason, I just wasn’t funny enough or whatever, and I was fired straight away after that pilot, which was a very humbling experience! AVC: In addition to Linda Fiorentino, you also worked with Alex Rocco on that film. AE: Oh, he’s great. I just saw him in New York a little while ago. My kids are fascinated with him because he was born on February 29th, so every Leap Year they go, “Oh, my God, it’s Alex’s birthday!” [Laughs.] He’s from a generation of character actors that you just can’t get enough of. It’s in that Joey Pantoliano realm, guys who have really good stories, they love what they do, and I think they’re just forever thankful that there was such a thing as an acting career that they could have. Like, to this day, Rocco loves his work. He loves everything about it. There’s a lack of cynicism about him that I always want to remind myself of, that we’re bizarrely fortunate to be able to make a living pretending. I try not to forget that, so I never get too sanctimonious about it. AE: The first thing that comes to mind is I remember when we were trying to figure out whether I was going to commit to the last four years. Like, we’d done the first four years, and then it was, like, “Are you gonna re-up?” When you’re an actor and you think of committing to the next four years, it’s overwhelming. You can’t imagine what you’re going to be giving up. And I remember talking to a friend of mine who’s an author, and he said, “Just remember: They’re getting the prime of your life.” And they are, in a sense. That age, the 30s, is really a prime time for people to create and do things. And it was a very conscious decision to sign on again, and I did it happily. This show, Zero Hour, is great, but that time is a real core, a center part of my life. And it really translated that way because it’s also the most important part of my life because that’s when my children were born. They were all born during those eight years when I was doing ER. You look back on it now and think, “That’s amazing!” But at the time, it’s just another day, another kid… [Laughs.] But it really was the most central part of my career. AVC: How did you feel about the evolution of Mark Greene as a character over the course of those eight years? AE: Well, the fun of it was that we had these writers, starting with Michael Crichton, who created the world, to John Wells, who actually brought together the team of writers. You understand because of what you do, but it’s important to remember that these shows are the result of an incredible group of writers working together, with lead writers taking certain episodes. But to create that dynamic in the writers’ room is probably more critical than anything else in a show, yet it’s probably not looked at as much. But when you’re on the show, it’s everything, because how those scripts come out and how those characters are developed is directly coming from who those people are, those writers that are creating it. And we had and went through a lot of different writers, but it’s that group that’s really responsible for why that show was on the air for 15 years. AVC: When the time came for you to leave the show, did you actually say, “I want Mark killed off?” Or did you just say, “I need an exit strategy,” and that’s what they came up with? AE: Well, I think what we were clear about—and this is both my wife and I—when I committed to doing that eight years was that that would be it. I would be done at eight years. And since John Wells knew my wife well enough, he knew that if she said that’s what we were doing, then that’s what we were doing. [Laughs.] But it gave them as storytellers the luxury of time. John said to me, “This character, he’s too central, he can’t just walk away from the show, so do you mind if we kill him?” And I was like, “Nope!” [Laughs.] “You’ve gotta do what’s best for the show, so that’s okay.” And as a result, they were able to write a year of the technical and the physical part of cancer and, more specifically, brain cancer. That was the next-to-last year. And then the last year was the emotion of saying good-bye and all that. So I think that’s why it was so effective: because the writers knew that they could tell that story without having to think, “Oh, but what if he renegotiates and we have to keep him alive?” We were all able to commit to it. AE: [Covers his eyes.] Oh, my God. A movie I don’t think I ever even seen. And yet it’s probably the most important movie I’ve ever worked on, because it’s the movie I met my wife on. What’s funny, though, is that she doesn’t usually do makeup on movies. She’s more of a fashion makeup artist. So the coincidence that we would end up in that same place—Peachtree, Georgia!—on that movie… me, who can’t even watch horror movies, and she, who doesn’t really work on films, and yet we ended up meeting there. It goes back to my earlier comment about how surprises are always the best experiences. AVC: You also got to work with Rob again recently. AE: Yeah, on Flipped! He’s just such a great guy. And he’s done some unbelievable work for the equal rights bill, the marriage bill, and what’s going on with that. It’s amazing what he’s done there. He’s really been instrumental in the fact that we’re now actually getting to the Supreme Court on that. It’s fantastic. AE: For me, Mr. Lefty Liberal Peace Lover, the great irony that something that probably helped propel my career more than anything in its essence was kind of… [Hesitates.] It’s not that I’m anti-pilot or flying. I love flying. I just got my pilot’s license, in fact. But that kind of glorifying of the military is… it breaks my heart a little bit. But that doesn’t apply when you’re doing slow-motion scenes and all that. Goose is a character that, like Mark Greene, I’m stopped every day about. And I’m a big motor-racing fan, so when I go to Formula One races or whatever kind of races, all the gearheads really love Top Gun. AVC: It seems like it’s stalled for now, but if the idea should be revived at some point, do you think a Top Gun sequel is a necessity? AE: Do I think it’s a necessity? Only if I can be Obi-Wan Kenobi and come back. [Laughs.] But I think you’ll find I was quoted somewhere about how I didn’t think it was necessary for it to be reissued in 3-D, either. AE: It might be in a selfish way, but it really made me feel good as an actor. It was the last film that John Huston worked on, and he wrote a letter to the financiers as to why I should play that role. It was just with that simple John Huston eloquence, but it just meant the world to me, because he believed that I could do it, and he wrote the letter saying as much. I spent that summer with him in Newport, and he actually passed away while we were making the film. He was just producing—his son [Danny Huston] was directing—but it was a really beautiful and poetic experience, in a way, to do that film. And to hear Lauren Bacall and John talk about those days when they were shooting The African Queen, talking about Bogart and being there—just to witness that was, like, the gift of a lifetime. AE: Gilbert: the role that’s probably the closest and truest to my heart. [Laughs.] It’s always that thing where people say they like it, but they do it in an apologetic way. Even to this day! I’m like, “No, I took the job! It wasn’t like I was forced to play it. I wanted to!” Again, it was a time period where I was working with Jeff Kanew, who was a young filmmaker, and all of us young actors, like Bobby [Carradine] and Curtis [Armstrong], who… I mean, now they’re doing a reality show about nerds [King Of The Nerds]? That’s so wild! Everybody just kind of decided to go for it on that film, and it really felt like summer camp, in a way. Tim Busfield, playing that Poindexter character, was great, and so was Ted McGinley. Everybody, really. It was craziness. The weekends on that movie were crazy, with the parties. It was not a restrained time. [Laughs.] James Cromwell, there’s another one [who] really went for it. He was so funny. And he’s the one who really invented that nerd laugh. It was his laugh early on, that he did in the car, that Bobby imitated. AVC: You may have had a great time on the first film, but you were barely in the sequel. Was that a matter of scheduling, or had you just kind of had all the fun you could stand? AE: I don’t think I really necessarily wanted to do it at all—I was just doing other things—but then they really wanted me to do it. So I ended up with a pool in my back yard that I called the Revenge Of The Nerds II pool. [Laughs.] Not that I’m complaining, but they seriously overpaid me for my weeks of work on the film, so I used it to put in a pool. AE: That experience… [Shaking his head and laughing.] Savage Steve Holland. What is that guy doing now? AVC: He works mostly on Nickelodeon shows now, I think. AE: The Polish brothers [Michael and Mark] continue to write really interesting, crazy movies, with “crazy” often being the operative word. Like, on Northfork, I mean, I had wooden hands. [Laughs.] That kind of says it all, really. How often do you get to play a guy who has wooden hands? AVC: Northfork may or may not qualify for this, but do you have a favorite project that you’ve worked on over the years that didn’t get the love you thought it deserved? AE: You know, it’s funny, because the making of something is such a personal experience, and you have that experience, no matter what. So there are movies I’ve made that were great that didn’t necessarily go well, but the friendships or the things that happened there stay with you. Film’s a weird thing that way. It’s not like theater, where you get to have that experience that night with the people. But the removed quality of it is that you almost can’t get upset about the failure in the same way that you can’t fully take credit for the success. And I think that kind of removedness keeps it more… I end up becoming more of an observer than invested, like, “Oh, it’s broken my heart that they didn’t get it!” There’s so much more. Here we are making this TV show, we’re doing it absolutely the best we can, but there’s a possibility that people are not going to like it, and they’re not going to watch. [Laughs.] And we can’t take that personally. We’re doing what we can to do it right. And if it succeeds, it’s timing and luck. And hard work, too, but… I guess I can’t take it too personally.